NEWS HIGHLIGHTS • Wind River delivers an integration between Simics and Simulink for processor-in-the-loop simulation to improve model-based design verification. • Simics enables early target hardware integration and validation in model-based design workflows. • Simics and Simulink integration allows testing of Simulink controller models on target architecture without the need for hardware boards and debugging tools. ALAMEDA, Calif. – Wind River®, a world leader in delivering software for intelligent connected systems, is working with MathWorks to integrate Wind River Simics® with Simulink for improved model-based design workflows. This collaboration creates smarter system verification by enabling testing and co-simulation of combined design and platform models, and helps drive better designs while removing risk from future development, test, and integration. By alleviating these risks, this solution can be particularly valuable to engineering teams developing complex and safety-critical products for industries such as aerospace and defense, automotive, and industrial markets. Model-based design is transforming the way engineers and scientists work by moving design tasks from the lab and field to the desktop. In model-based design, a system model is at the center of the development process, from requirements development through design, implementation, and testing. When software and hardware implementation requirements such as fixed-point and timing behavior are included in model-based design, teams can automatically generate code for embedded deployment and create test benches for system verification, saving time and avoiding the introduction of manually coded errors. As part of an ongoing collaboration with MathWorks, Wind River has integrated Simics with Simulink to support processor-in-the-loop (PIL) testing. 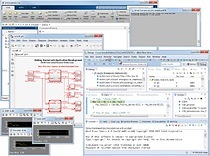 Simulink is a block diagram environment for multi-domain simulation and model-based design, and has widespread usage for model-based design in the embedded system market. It supports simulation, automatic code generation, and continuous test and verification of embedded systems. PIL testing checks that code generated from a Simulink controller model using Embedded Coder will run correctly on the actual processor that will be used in the final target system. Prior to PIL testing, control algorithms are typically developed and validated on the host, using a high-precision floating point math and with no concern for the implementation system and any cross development tools such as compilers that can impact on-target behavior. The Simics PIL integration for Simulink is available today for all Simics customers. Simics integrates with many other simulation tools to create unique virtual systems for software development and testing. For more information on integrating Simics with simulation tools visit Wind River at www.windriver.com/simics/. Simics is part of the Wind River Helix™ portfolio of products enabling Internet of Things (IoT) advancements. To learn more about how Wind River is addressing the opportunities and challenges from IoT, visit tinyurl.com/WindHelix. Wind River, a wholly owned subsidiary of Intel® Corporation (NASDAQ: INTC), is a world leader in delivering software for intelligent connected systems. The company has been pioneering computing inside embedded devices since 1981, and its technology is found in nearly 2 billion products. Wind River offers the industry's most comprehensive embedded software portfolio, supported by world-class global professional services and support and a broad partner ecosystem. Wind River delivers the technology and expertise that enables the innovation and deployment of safe, secure, and reliable intelligent systems. To learn more, visit Wind River at www.windriver.com.